Why don't we say "J'aime toi" instead of "Je t'aime" I was under the impression that you only use the reflexive pronouns me, te, se ... when you have a reflexive verb where the subject is referring to itself... for example: Je me lave... or when two parties are doing a reciprocal action for example: ils s'aiment. Any explanation would be much appreciated. The difference between the personal pronouns te/t' and toi is not that one is reflexive and one isn't. They're chosen based on grammatical rules including the grammatical function of the pronoun, the preceding preposition if any. Whether the pronoun is reflexive only matters for the third person, and only when there is no preposition. The rules are fairly complicated. In this answer, I'll only cover the main cases. See also Reste-t-il en français des traces du système de cas du latin ? for a historical perspective. If the personal pronoun is the subject of the clause (and the subject is this single word), it's je, tu, il/elle, nous, vous, ils/elles. 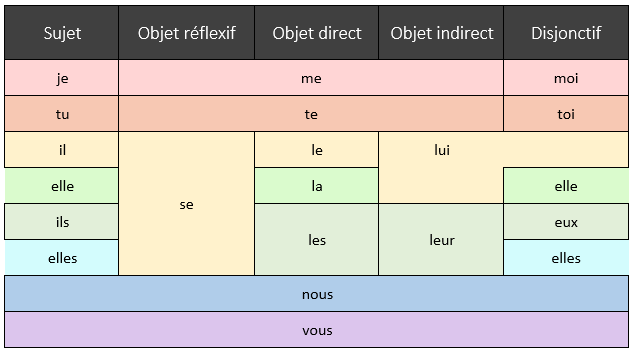 If the personal pronoun is a direct complement (complément d'objet direct), it's me, te, le/la, nous, vous, les, and it is placed before the verb (including any auxiliary), but after ne if the sentence is negative. Je ne les ai pas vus. A direct complement has no preposition, but some complements that have no preposition are not direct complements. As a rule of thumb, if something is a direct complement, you can change the verb to the passive mood, and the direct complement of the active sentence becomes the subject of the passive sentence. An attribut du sujet (complements of verbs that indicate a state, such as être) is not a direct complement. The “default” form is moi, toi, lui/elle, nous, vous, eux/elles. These forms are used after a preposition. These are also the forms for the attribut du sujet, among others. Sometimes, when the indirect complement is a pronoun, it changes form and is placed before the verb with no preposition. à + pronoun that stands for a person → me, te, lui, nous, vous, leur. Note that this is identical to the direct-complement form for the first and second person, but not for the third person. à + pronoun that stands for a thing (not a person) → y.
de + third-person pronoun that stands for a thing (not a person) → en. Il vient de cette ville. Il en vient. This substition de → en is also made when de is part of a partitive article. See When to use the pronoun en? for more details. If the subject and the complement are the same person or thing and the complement does not start with a preposition, then there is a different form for the complement, but only for the third person: se (both singular and plural). This includes both reflexive verbs and cases where the subject and complement just happen to be the same. This includes direct complements, implicit-à indirect complement and attribut du sujet. In the plural, this form is used both when each subject performs the action on themselves and when the subjects perform the action on each other. Il les a conduits, eux ! Not the answer you're looking for? Browse other questions tagged grammaire pronoms pronoms-personnels pronoms-réfléchis or ask your own question. Reste-t-il en français des traces du système de cas du latin ? When to use the pronoun en? Does “en” always carry roughly the same meaning as “in”, or might it need to be paraphrased? “Je me suis envoyé un mail” or “je m'ai envoyé un mail”? How to phrase “proposer de [infinitive] à [someone]” for two distinct subjects? Why is “ses” considered better than “les” in “Il a ses doigts sur la table”?